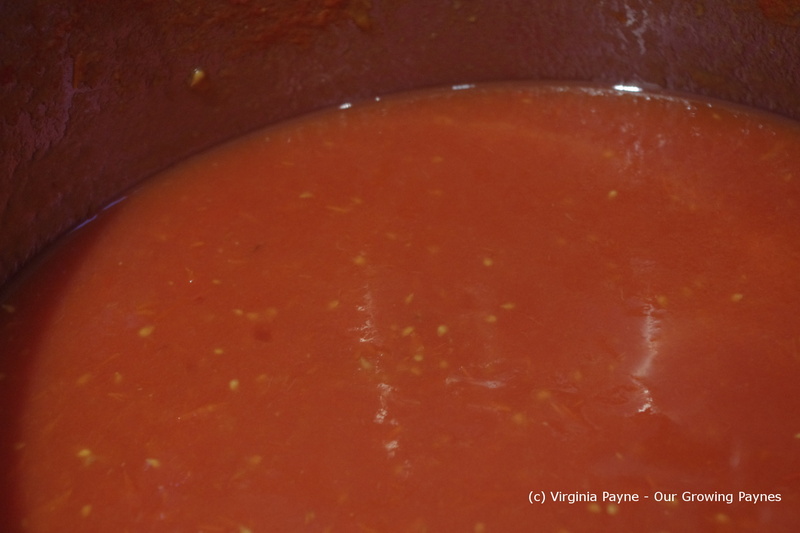 In the past I’ve made tomato sauce that had other ingredients like peppers, onions, etc. But we’ve branched out with various types of food that asks for tomato sauce but not the flavour profile of Italian cooking. So this time it is just garden fresh tomato. That’s it. We grew a lot of Roma, Amish Paste, and yellow tomatoes. We also had leftover seeds for one other that I can’t remember what it was but it was a heirloom one. 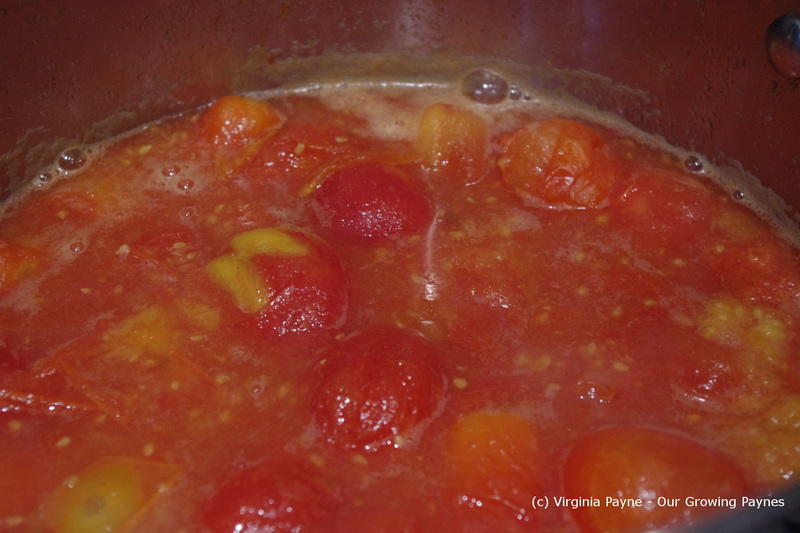 Take a large cooking pot and turn the heat on to medium and start tossing in the tomatoes. I filled it to the top. It will reduce down as the tomatoes heat up. I gradually added the tomatoes as space allowed. I know a lot of people like to quickly boil the tomatoes then peel them. That is a lot of work. I tried that and I had a lovely mess on my hands. Back to keeping it simple! Let it simmer to reduce for a couple of hours. I didn’t reduce too much this time round as I found previously if it is too thick you need to add other fluids then reduce down according to the recipe. I would rather have the tomato flavour at it’s finest for the recipes. So far it’s proved to be a good choice as in this recipe for Tomato Ginger Chicken. To finish we used an immersion blender to make everything was well blended. I sterilized the jars and canned the sauce. Process the jars for about 5 minutes in boiling water. This entry was posted in recipes and tagged tomato sauce, tomatoes, vegetarian. Bookmark the permalink. Definitely the way to go. 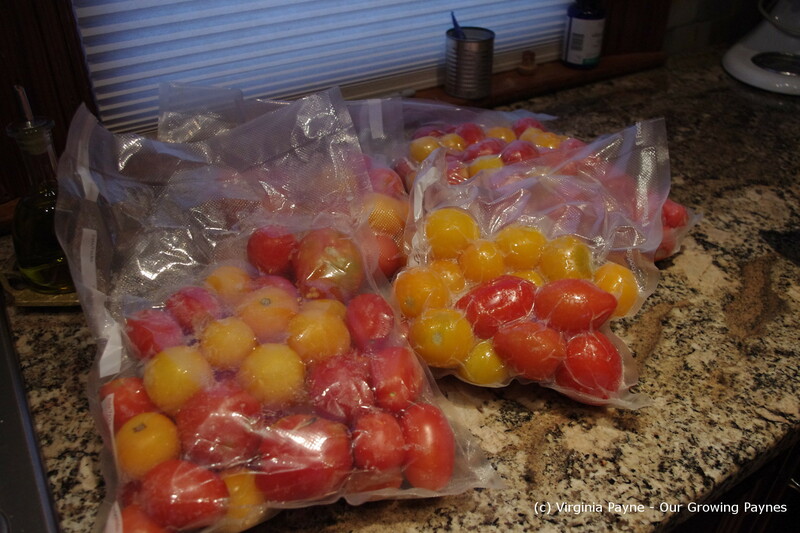 I freeze my tomatoes in the summer also – so much easier. 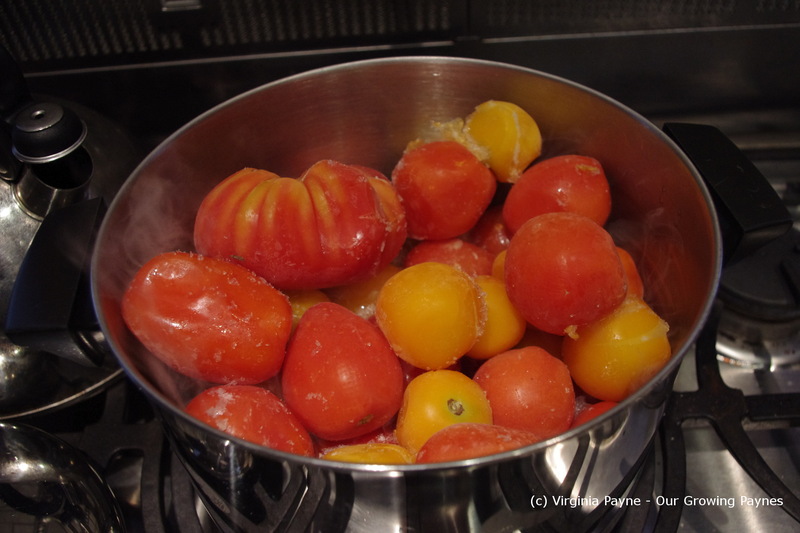 The tomatoes then are available for soups, quick sauces or for making a big batch of spaghetti sauce. The taste is very fresh, even though the tomatoes have been frozen. Don’t you just love the immersion blender – saves time and clean-up. I know! It was a great invention. 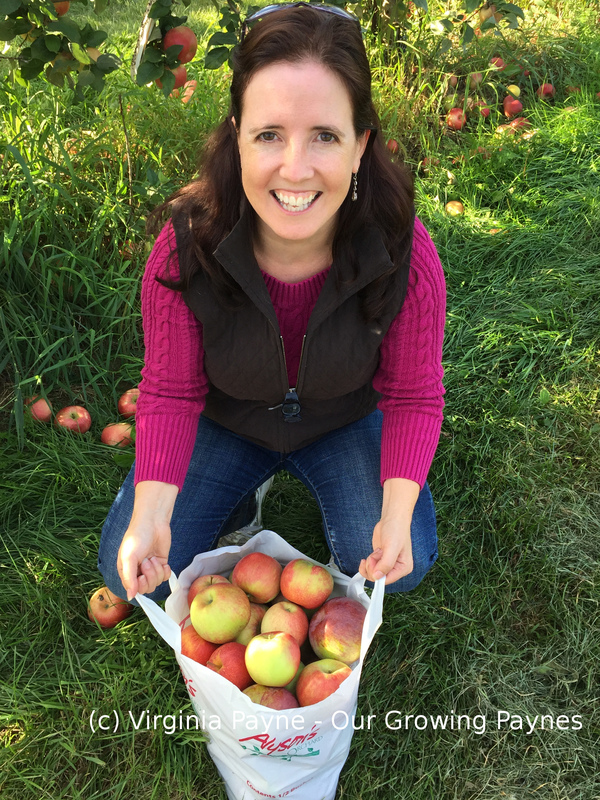 A lovely fresh taste reminiscent of summer – just what is needed to lift the spirits in winter. I have some roasted tomato sauce left from the autumn and am saving it to savour on a grim day. Judging by our forecast, it could be this week! Thanks. Did you get much snow? I know my friends just north of Rochdale got several inches. They went sledging today. We hope to plant more tomato plants this year, maybe 3 beds so we have plenty to experiment with. I’d like to try a roasted tomato sauce. No snow here, sounds chaotic on the mainland. Very wet and windy here, quite mild not even any sleet to speak of. It may be wet but I am very glad to avoid the misery of driving in snow in the UK. Looking forward to sowing my tomatoes soon! The UK is having a whole range of weather! My in-laws in Swanage are having warmish weather though loads of rain. Just as I was about to write about your tomatoes I saw your comment above. Swanage! oh what happy memories I have. I have never frozen whole tomatoes but it works so I shall give it a go, if we get any tomatoes this year. The weather so far is horrible. Isn’t Swanage a great place? I love the cliff walks. Yes. My parents used to have a cottage there, which had an amazing pantry. I remember Peter the butcher and the Black Swan, many years ago now, but happy memories. The Black Swan is still there. I like going to the Red Lion as it has that real pub feel and they are very friendly with lovely food. I go to the Fish Plaice for my first lunch when I get there. So good! It was the landlord I think that made the Black Swan for us, I think his name was Sid, my brother loved the fact that on Boxing day a free buffet was laid on for the regulars. This was many years ago. Lovely. 🙂 Though they’ve modernized it a bit with the games machines, etc. It doesn’t have the pub feel. I never realized tomato sauce could be that simple! Nice call using the immersion blender. It must be the weather. We’re all making sauce, in one form or another. 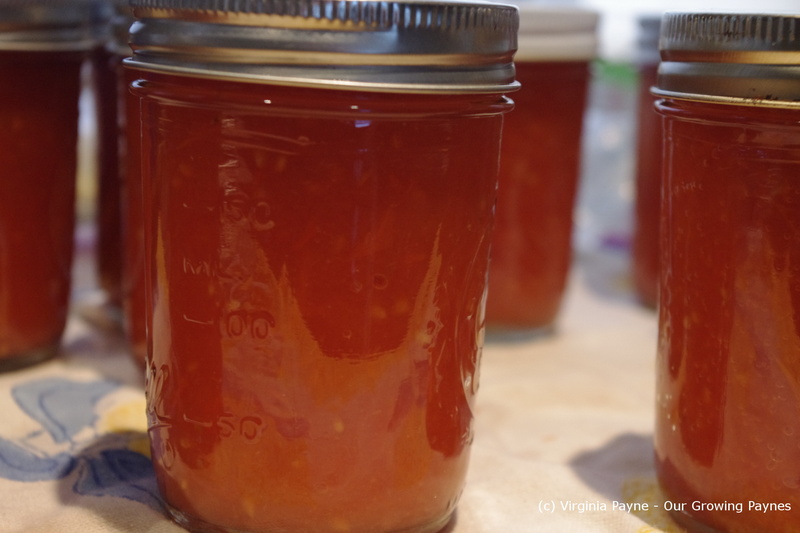 I prefer canning the tomato sauce as I’ve found freezing the sauce causes crystals to form with the water and it changes the consistency of the sauce. Canning doesn’t. I agree. That’s why I don’t cook my tomatoes before freezing. Like your tomatoes, mine are raw when frozen.